The WMCP miniature load cell model adds overload protection to the popular WMC family features of environmentally sealed, stainless steel housings, proprietary temperature-compensated strain gages and small load cell sizes for convenient mounting and machine integration. WMCP load cells are available in capacities of 250 gf (0.55 lbf), 500 gf (1.1 lbf) and 1000 gf (2.2 lbf) in both tension and compression. This load cell can be overloaded by 32 times the rated load without damage to the sensor, protected by a dependable mechanical stop not previously available in the WMC Miniature family. This protection greatly reduces the risk of signal error or damage from unpredictable, excessive load forces. 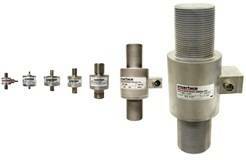 The Interface WMC load cell family of miniature force sensors offers a variety of options to address specific applications needing the slim design, the environmentally sealed stainless steel housing, or the wide capacity range. WMC model capacities start at 0.55 lbf (250 gf) with a 2mV/V output in a small 0.75” (19.05 mm) diameter housing. The largest WMC Rod End load cells offers capacities up to 200K lbf (890 kN) in a slim 4.47” (113.54 mm) diameter housing. The WMC load cell family includes optional male or female threaded mounting for flexible design, replacement or retrofit application requirements. The environmentally sealed, stainless steel housing is compatible with extreme environments found in the oil and gas industry and other industrial applications exposed to corrosive materials. Founded in 1968, Interface Inc. is the worldwide leader in providing load cells, torque transducers, calibration load cells and multi-axis transducers to major automotive, aerospace, medical, energy and materials testing facilities. The Interface Gold Standard™ Calibration Load Cell is the standard used by major testing labs. All Interface Low Profile™ Load Cells use proprietary Interface strain gages, are moment compensated and are tested before shipment. All Interface calibrations are NIST traceable. Interface Inc. works closely with the medical, automotive, energy, aerodynamics and material testing industries. The Interface lab has A2LA accreditation per ISO/IEC 17025 for both load cell and torque sensor calibration.